Canada is nearing an important crossroads in our response to homelessness. Since homelessness emerged as a significant problem – in fact, as a crisis – in the 1990s, with the withdrawal of the federal government’s investment in affordable housing, communities have struggled to respond. Declining wages (even minimum wage has not kept up with inflation in any jurisdiction in Canada), reduced benefit levels–including pensions and social assistance—and a shrinking supply of affordable housing have placed more and more Canadians at risk of homelessness. For a small, but significant group of Canadians facing physical and mental health challenges, the lack of housing and supports is driving increases in homelessness. Prevention measures – such as ‘rent banks’ and ‘energy banks’ that are designed to help people maintain their housing – are not adequate in stemming the flow to homelessness. The result has been an explosion in homelessness as a visible and seemingly ever present problem. Over the past 10 years we have learned much about what to do to end homelessness – the need to shift from a focus on managing the problem (through an over-reliance on emergency services and supports) to a strategy that emphasizes prevention and, for those who do become homeless, to move them quickly into housing with necessary supports. The success of the At Home/Chez Soi project demonstrates that with housing and the right supports, chronically homeless people can become and remain housed. While there are still areas that need work – we need more robust solutions for youth homelessness, women fleeing violence and Aboriginal homelessness – we are figuring out solutions on the intervention side. The one missing piece of the puzzle, however, is affordable housing. The decline in availability of low cost housing (and in particular, rental housing) affects many Canadians – young people setting out on their own, single parents, people working for low wages and the elderly. It also contributes to the homelessness problem in a significant way. 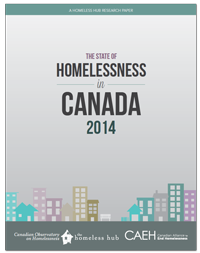 The State of Homelessness in Canada 2014 sets the course for ending homelessness in Canada. We know quite well what factors have contributed to the dramatic increase in homelessness over the past 25 years. Since we know what the problem is, we can propose the solution. How Much Does It Cost to End Homelessness in Canada?